The centenary of the end of the First World War is fast approaching and we all recognise the horror and tragedy that armed conflict has brought, and still brings, to the lives of many around the globe. Commemorating this moment allows us to listen to the voices of the past to reflect on how we use the freedom we have today to create peace, to listen to others and commit to forming radical ways to resolve some of the issues we are facing today, issues like social isolation, bullying, gang culture, racism and extremism. We are inviting young people to use our INSPIRE peace charter to create shared pledges of action, to collaborate with peers, those in authority and their local communities to create new initiatives that use their entrepreneurism, passion and networks to build peace. Most importantly, using the momentum of these peace initiatives, we will hold simultaneous INSPIRE events in high profile venues across the country on the 9th November 2018. These events will provide young people with a unique opportunity to commemorate Armistice Day 2018, be part of a movement with their peers, collaborate with each other, and celebrate what can be achieved when they commit to being ambassadors for peace to transform their neighbourhoods into places of reconciliation and inclusion. 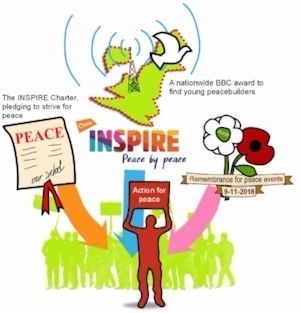 INSPIRE is a project for young peacemakers. 100 years after the end of World War I, we want to inspire a new generation, not only to prevent war but to build peace. INSPIRE is a growing collaboration between Quakers in Britain, Corrymeela, Coventry Cathedral, Oasis Trust, and Wales for Peace. There are three ways to get involved: a Charter for schools, Remembrance events and an award, all focusing on how we build peace. The project culminates in November 2018, but we’re keen to engage schools and young people now. We’d like your help with that. The charter is a commitment for an individual, and perhaps their school or youth group, to commit to working for peace, whether that means challenging the arms trade or confronting racism in their own community. The charter comes with a pledge to take action, plus lots of resources and ideas for young people to do just that. We’d love you to encourage schools and youth groups to sign the charter. This peace work will be celebrated with national awards hosted by BBC Radio, which will showcase examples young people acting as peace-builders or ambassadors for peace. Who will you nominate?